This post is Part 17 of a series to augment the Atlas of the Known World available for free download. Start with Part 1 here. A seething jungle of magic and nymphs. You voted The Glades of Despair winner of October 2014 by 69%. In Chapter 12 of Awakening, the dense canopy of the glade veils the mythic city A'lara and casts a shadow on all who dwell beneath it. Jutting from the cursed badlands of Old Ryerin into the sea, the glade sees more rainfall than the rest of the Allanic continent combined. Mild, wet winters give way to sultry, humid summers, and over half the glade lies within a massive river basin that drains to the east. This region also borders the Desperate Sea, the Great Sea, the Great South Sea. Shifting branches and animate vines slither through the Glades of Despair, fueled by the pent-up magic of the mythic city A'lara. Though diverse plant life defines--and defends--the glade, few animal species have survived the centuries of moving vegetation. Without their usual predators to check populations, insects proliferate in great numbers. The largest known creature, the speckled macaque, weighs just over five pounds. These tailless monkeys have been known to spread disease, and live in dwindling colonies facing extinction. Within the writhing foliage of the glade, only the fair-skinned nymphs move freely. Because their life force corresponds to the amount of surrounding life, nymphs retain youthful bodies within the verdant rainforest, and elsewhere their apparent age fluctuates with the landscape. Isolated by the fierce vegetation and curse of the badlands to the north, nymph tribes haven't encountered outsiders in centuries. Both genders wear abundant jewelry and basic leaf coverings, though style and extent differ between tribes and individuals. Nymph women tattoo the right sides of their bodies, each tribal stripe correlated with a learned magic skill. All nymphs rely on powerful Plant magics, essential for life within the animate glade. Sensory magics tend to be weak, but the rare Touch or Scent mage has occurred. Despite their primitive lifestyle, nymphs use strong Metal magics for advanced smithing and smelting, mostly to craft ornate jewelry and arcane talismans. Of all the races, nymphs make the strongest Earth mages, fostering a tradition of stonework unmatched in the Known World. Though weaker than the nymphs' prime element, Water magic is not uncommon and highly prized during the wet season. Nymphs maintain strong family bonds through extensive physical contact. They consider wisdom and magic the same concept, earned with age and experience. Men live in large villages, raised by male mentors and often apprenticed to particular trades. Women travel the glade in small family groups called rings, led by the oldest and wisest member. Adult women visit villages along their nomadic routes for recreation and progeny, but both genders disdain each other and restrict contact to coitus. Each ring surrenders male children to a specific village, which that ring excludes from visitation. Time is marked in seasons, and nymphs reference past seasons by the wisdom acquired then. Women discern another's age from tribal tattoos that start at the right shoulder. As wisdom is earned, mnemonic stripes cover her arm and leg before ascending to her face, and skilled mages begin a left sleeve in later years. Men rarely tattoo themselves, and instead gauge others by skill and proficiency. When they come of age, men create their own huts, where they service the nightly influx of women within range. Known as virile duty, this reception is considered a youth's duty to the retired mentors of his village. A woman comes of age in a ring-wide ceremony preparing for her first copulation. Often, an older sister or aunt accompanies the young woman into the virile's hut for guidance and moral support. For the past three centuries, the animate vines of the glade supplanted the need for nymph warriors. Most metal-workers now focus on jewelry, but certain rings and villages preserve the art of sword-making. Revered for their wealth of knowledge, these families are the only known to accept outsiders seeking to learn the ancient skills. Those who prove their dedication earn battle techniques and martial arts, achieving a prowess in combat far more respected than sword-making alone. The nymphs of the glade speak assorted dialects of A'lari, and most have no understanding of Allanic, the common tongue of the Known World. Oral history dominates the glade, and A'lari has no written component at all. To Allanic speakers, A'lari sounds fluid and nuanced, with few consonants and hardly discernible vowels. Though Allanic shares its language family, the oral tradition of A'lari has caused it to diverge and mutate faster than its written relatives. Even within the glade, family units speak different dialects, and sometimes cannot understand each other. 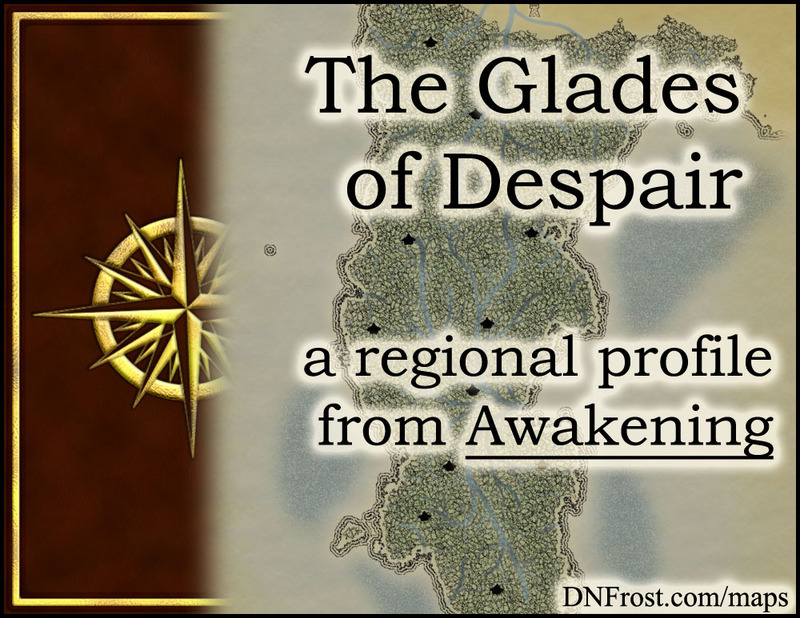 In the book Awakening, Kingard ventured into the Glades of Despair long ago to forge the mythic city A'lara. He emerged from the city imbued with incredible power, which he used to oust an ancient evil from the land of Allana. Centuries later, Kingard now leads a mismatched band to unleash the city's power as evil rises again. Shielded from danger by the magic saturating the glade, they trek through the dense rainforest to reach the old city, unaware of the traitor lurking in their midst.